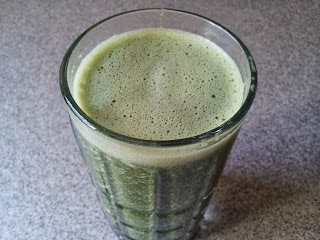 Put water, spinach and cucumber in blender; blend on high to smooth it well. Add ginger, Green Vibrance, Joint Vibrance and blend on slow to mix without the powdered ingredients sticking on the top and then increase to high so that everything is blended well. You can strain this after blending or drink as is for full fiber benefits. * You "tweak" this recipe to your taste and needs. For example, you can add a stevia to sweeten more or just the Green Vibrance though not the Joint Vibrance. You can add ice to make it more like a smoothie or serve over ice as a juice drink. However you choose to adapt this green juice / green smoothie recipe, you will get over 25 billion probiotics as well as complete daily doses of fruits, veges, vitamins and minerals by having the Green Vibrance in it ... The Joint Vibrance has additional health benefits including curcumin. The cucumber and ginger give it a fresh taste. Make sure not to use too much lemon or it becomes too tart. You can get Green Vibrance and Joint Vibrance from Amazon. They give me a very small percentage, but it help supports this blog. You may also find it available at your local health food store. I like the products because they are clean, natural and / or green; they are transparent about their ingredients so "no proprietary blend"; all ingredients are listed on the products. I started using Green Vibrance after researching which superfoods to add to smoothies. It is a product that raw food vegans trust to supplement their diet as it has your daily recommended intake of fruits and veges, more vitamins and minerals than we could eat in a day, as well as the 25 billion probiotics. In other words, super nutritious ... A smoothie made with vegetable based protein and Green Vibrance can replace a meal. I use the Joint Vibrance because I am getting older and it helps with how my body feels after workouts. Plus, it has curcumin to fight cancer. I am not a doctor or dietician, just sharing what I have learned and what works for me. You can still take your Skinny Fiber for appetite control as it is a weight management supplement and the Vibrance products are superfoods products.